For systems well designed, the user is often the weakest link in the security chain. Engineers have a tendancy to overestimate the technical risks and underestimate the human interactions. It doesn’t mean that we can avoid technical measures. But it’s very important to take in account the possible behaviour of the user. That means that adding a text to explain him/her the consequences of a click on a button can increase the security a lot much than forcing him/her to do things. For example, forcing users to change regulary their password makes them choose passwords that are a lot weaker (but easier for them to remember). Also known as layered defense, defense in depth is a security principle where single points of complete compromise are eliminated or mitigated by the incorporation of a series or multiple layers of security safeguards and risk-mitigation countermeasures. Have diverse defensive strategies, so that if one layer of defense turns out to be inadequate, another layer of defense will hopefully prevent a full breach. What is the application that makes this request? What are the permissions for this application? Which grant is used, in particular for applications with public pages? What are the permissions for this grant? Using secure, httpOnly, sameSite cookies to avoid cookies theft or misuse. Using a Content Security Policy (CSP). Using X-frame-options http header to protect against click-jacking. But we will use a CSP very restrictive by default (no access to other web domains for example). If we take the OWASP top 10 vulnerabilities, we can see that a lot of them are related to trusting inputs. It starts with the first one, injections, but it goes also to XSS and unvalidated forwards (in OAuth2 notably). Always sanitizing inputs is a good pratice that improves security, but has also some nice effects like helping developers discover hidden bugs. It’s not possible to index encryped documents or do computations on the encrypted fields in reasonable time (homomorphic encryption is still an open subject). Having more encrypted data can globally weaken the encryption, if it’s not handled properly. If the encryption key is lost or a bug happen, the data is lost with no way to recover them. 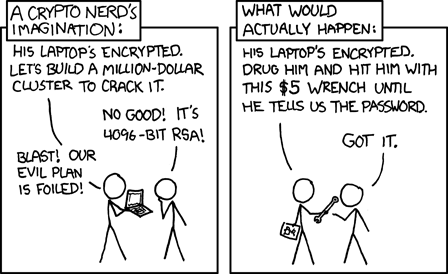 So, we are more confortable to encrypt only some fields. And later, when we will have more experience and feedbacks from the user, extend the encryption to more fields. We are also working with SMIS, a research lab, to find a way to securely store and backup the encryption keys. Standards like https and OAuth2 had a lot of eyes to look at them, and are therefore more robust. Reinventing the wheel can be valuable for some things. But for security, the cost is very high and only some very particular constraints can justify such an high cost. Cozy don’t have these constraints, so we will stick to the standards. It’s important that deploying a cozy is well documented, doesn’t require too many steps and can be automatized. An error on the installation can have dramatic effects, like the database being leaked on internet. So, we need to really take care of the devops experience. In particular, having sane defaults for the configuration will help to minimize the number of things he/she has to do, and such the number of places where he/she can make faux pas. No code is directly pushed to the master branch in git. It has to be reviewed by at least one member of the core team (ideally the whole team), and this person can’t be the author of the change. Even the best developers can make mistakes, and we don’t pretend to be them. Our force is to work as team. Our code is Open Source, external contributors can review it. If they (you?) find a weakness, please contact us by sending an email to security AT cozycloud.cc. This is a mailing-list specially setup for responsible disclosure of security weaknesses in Cozy. We will respond in less than 72 hours. Make a pull-request to fix (on our private git instance) and test it. Publish a new version, announce it on the forum as a security update and on the mailing-lists. 15 days later, add the details on the forum.